Although I have said in previous articles that banner advertising has some benefits that make it a close contender to pay per click advertising, it also has many disadvantages which ultimately result it being second best. Overall, pay per click advertising will always be on top in the war for dominance in online advertising. They have the likes of Google leading PPC into new technology which continually persuades new advertisers to go for PPC. 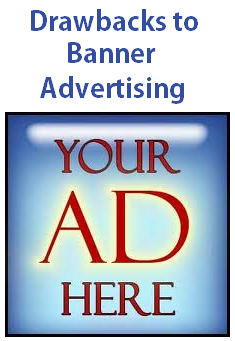 Banner advertising is an extremely old form of advertising compared to PPC which was introduced in 2000. This may be a reason why banner advertising is not as successful as PPC: banner advertising is sticking to old habits and has found it harder to adapt to new technology. Either way, here are the main drawbacks to banner advertising advertisers will face. Less Advertisers – If there are less advertisers publishers will find it harder to sell their advertising spaces because the competition has decreased. Less Publishers – If there are less publishers, advertisers will find it harder to buy an advertising space contextual and relevant to their advertising campaign. This will decrease their campaign’s performance. With being the biggest banner advertising program and only having advertisers and publishers in the thousands, it makes clear how far behind it is to PPC: Google AdWords and Adsense have million of users dominating advertising online. When you are an advertiser that uses banner advertising, there is an element of risk which isn’t present in PPC being the risk of choosing the wrong website for the wrong price. In PPC, you have automatic contextually based websites to advertise on. With banner advertising, you are what makes it contextual. This is why you need to be extremely careful when choosing what websites to advertise on. Getting the wrong website for your campaign will be a waste of time and money. Although you may think this is a benefit to banner advertising because it provides some safety to a campaign, it can be seen as a drawback too. Providing a fixed sum of money for a certain amount of days can prove to be quite successful that is if the website you advertised with performs better than expected. However, there is always the chance the website won’t perform as high as you expect. The website may have a traffic dip etc. This is another risk with banner advertising which cannot be solved. As an advertiser you will need to make sure you choose the right website for your campaign. Even though I have made banner advertising sound very bad, I still think you should try it. A lot of advertisers automatically go to PPC without taking into consideration other advertising forms such as banner advertising. You may find that your campaign will perform better with banner advertising than PPC. Experimentation in advertising is what helps to optimise a campaign.